Two 24 year old female walkers called 999 saying one of their party was hypothermic. 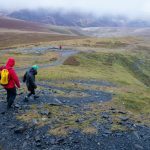 They were walking from Great to Little Dodd on the Helvellyn Range in showery and windy conditions with bad visibility. The Landrover team returning from a previous job went direct to approach via the Old Coach Road fromSt Johns in the Vale whilst a second team set off to approach from the Dowthwaite Head end of the Old Coach Road. The party was met descending at the back of Wolf Crag, they were given warm clothes and escorted back to the team vehicle and driven to their accommodation.